“Stop Trying to Read Other People’s Minds"
Today driving back to Chicago from my parents’ house in the suburbs I was particularly cautious because of the dark flurry-filled highway. Night was fast approaching on my drive home and by the time I reached the city streets there was no longer any sunlight to aid me. When I had stopped at a light on Lincoln Avenue I glanced out the car door window. Suddenly I realized it was not a low-visibility snowy evening, but a crisp clear night. At this I instinctively prompted the wiper fluid. Lo and behold I had been unnecessarily struggling from something I had expected even before I got in the car, a night where the air was filled with snow, which would be difficult to drive in. The night air was as clear as it had been on any cold cloudless night in Chicago and I just did not realize all I had to do was clean the windshield. Just as I needed to clean the lens through which my highway journey was viewed, any successful moment starts with clarity of mind and perspective. I had been feeling stress during the week about situations with my cold apartment and a blown fuse, and the prospect of work that had to be done. Every time I thought I was making some progress, something else would come up and require my attention. As I began to flounder I realized that before anything could be done, like decisions, work, and planning, I first had to relax into a state of peace and perspective. My actions were not yielding positive results. The results were expressing the energy with which I had produced them. So before you try to fix a situation so that you can be at peace, remember that the only way to create the success you want is to first be at peace and then go about doing whatever it is you have to do. You need to go beyond the mind to untangle yourself from the thoughts that are creating the dis-ease. When I arrived home I received a “Present Moment Reminder” email from Eckhart Tolle stating the three things you can do to become peaceful at any given moment, “Wherever you are, be there totally. 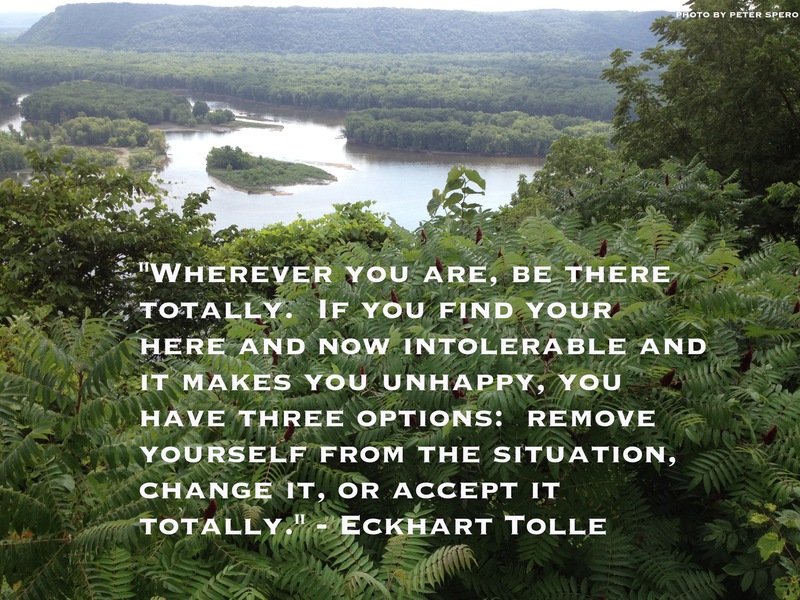 If you find your here and now intolerable and it makes you unhappy, you have three options: remove yourself from the situation, change it, or accept it totally,” Eckhart Tolle. I love Eckhart, his books were the journey starters for me. I read The Power of Now only a year ago and it has improved my life immensely. That is so exciting! A few years ago I read A New Earth and it really shifted my perspective. I found reading The Power of Now to be incredibly meaningful after that. Love it!!!!! You’re an amazing writer! Thank you, your support means so much to me! Positive and Purposeful Approach to Life. Enjoy this blogger’s thoughts!